Why hair transplant is the one stop solution for hair restoration? The main difference between hair transplant and any other hair restoration procedure is the permanence and results. hair transplant procedure provides results that look and feel so natural no one should be able to tell if one has had the procedure done. Recent advances in medical technology have not only made the dream of restoring ones hair a reality, but made the dream of natural-looking results the presumed norm. It depend on the number of grafts(hairs) required, however it is only an outpatient procedure patient can come in the morning and get the procedure completed by late noon. How many grafts will a patient require ? It entirely depends on the degree of hair loss and the individual’s demand age of the individual is also a factor that determines the number of donor hairs as well as the survival rate of the grafts. Certainly anesthetic injections are given locally onto the donor and recipient areas. only for the injection’s pricky pain thereafter patient will experience minimal numbness/soreness. What will be the recovery time ? May be a day or two, however the recovery time depends on the individual’s pain tolerability also with ultra modernized techniques the recovery & healing rate is rapid. the soreness is minimal & can last for few days following surgery. Will anything look odd after the surgery ? The tiny incisions in the recipient site resemble thorn pricks. red scabs around these incisions will be visible in the subsequent days. healing may require a week to 10days, caps/hats can be worn to mask this appearance. When will the growth of transplanted follicles be noticeable ? Following transplant , New hairs erupt from follicle taking 3 -6 months. the growing hairs are thin slender later thickens out, at least a year it takes to look natural thick and mature Transplantation) methods. They differ primarily in the way hair follicles are extracted from the donor area. On your first visit, your dermatologist will assess your degree of hairloss, dimensions of the bald area, donor site hair’s nature & number. Clients who opt hair transplant surgery will be familiar with these terms FUE or FUT. Follicular unit transplantation( FUT) and follicular unit extraction( FUE) – these are the surgical methods by which hair for transplant is obtained from the donor site. 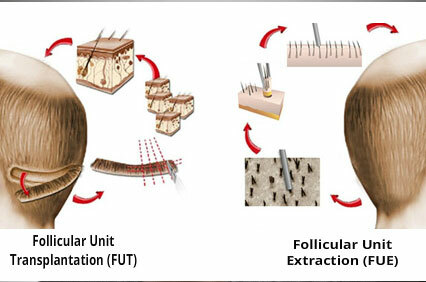 FUT involoves removal of thin strip of hair ( 15 to 20 cm ) from the donor site. FUE involves removal of each hair graft from the donorsite one by one, with the help of a punch tool. Only the hair removal technique differs , the transplant method is the same. With FUE shaving of the entire scalp is required prior. With FUT the area from which the strip of hair to be removed is trimmed. Even the most skilled hair transplant surgeon cannot perform hair surgery without scars. Both FUE and FUT techniques create scars. At pravit we offer both FUT and FUE methods. we always assess the individual’s needs and advise on the best technique. With FUE , yield of graft is lower as each second graft has to taken only from the safe donor area on compulsion the surgeon has to take grafts outside the donor area with ageing these hairs becomes thin and shred soon. In FUE Extracting hairs with a punch tool is not so accurate as with microscope usage in FUT. when hairs outside donar area are extracted in FUE, tiney circular scars results which become obvious over time. In FUT procedure suture becomes mandatory, patient needs another visit to the surgeon 10-14 days later for suture removal. In an FUE hair transplant procedure no stitches are needed. Even the most skilled hair transplant surgeon cannot perform hair surgery without scars. Both FUE and FUT techniques create scars. scar is linear in FUT. whereas in FUE scars are multiple circular across a large area. the most significant advantage of FUT over FUE is that large numbers of follicle units can be transplanted in one session. During an FUE treatment, the greatest number of follicle units transferred is about 2,000. On the other hand, an FUT may involve the transfer of 4,000 follicle units. Only FUT has higher rate of follicle survival.hence, patients with limited hairs in the donor area are suggested with FUT .